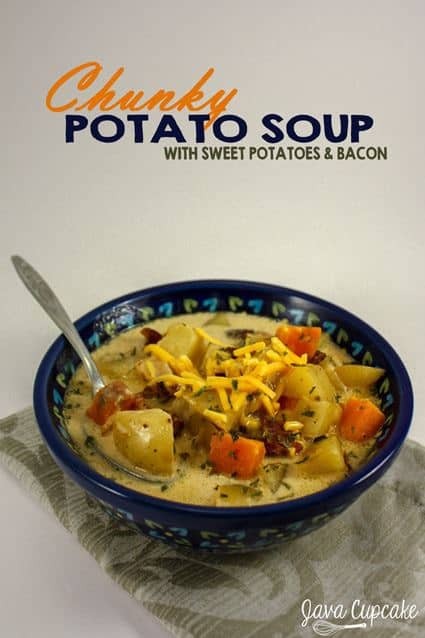 Chunks of yellow potatoes and sweet potatoes in a creamy broth with thick cut belly bacon makes this hearty soup the perfect Fall dinner. I’ve been making soup almost every week since it started to get really cold here in Bavaria. Pumpkin chili, ham hock & 15 bean soup, split pea with ham and now this Chunky Potato Soup. I need to be honest with you though… before today I had never had potato soup let alone make it from scratch. But, potatoes are one of my most favorite things to eat since I’ve moved to Germany that it just sounded like a good idea to try! I mean how can you go wrong with a soup that is all creamy, delicious potato? In my world… you can’t. This Chunky Potato soup starts with a pound of belly bacon. Now, if you don’t know what belly bacon is let me tell you it is so incredibly delicious that once you start using it, you’ll never use any other kind of bacon, ever. This type of bacon comes from the belly of the pig and has both strips of fat and strips meat in it and it typically cut thicker. After the bacon is browned, onions and garlic are added then two types of potatoes. In Germany, big yellow potatoes with thin skins called Gelb Kartoffeln are most popular so that’s what I used (Yukons would be a good potato to use in the USA) as well as one large orange sweet potato. Seasoning, heavy cream, milk and chicken stalk with a touch of flour are the final ingredients to be added. I had contemplated adding corn to the soup, but I didn’t have any. I think the could would make a great addition to the soup though, adding even more great flavor to an already delicious soup. 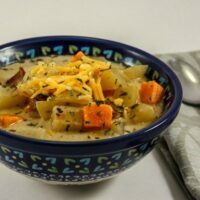 In less than an hour, this Chunky Potato Soup can go from ingredients in your fridge to bowls in front of your family or friends. It’s simple, hearty, creamy and just damn delicious. 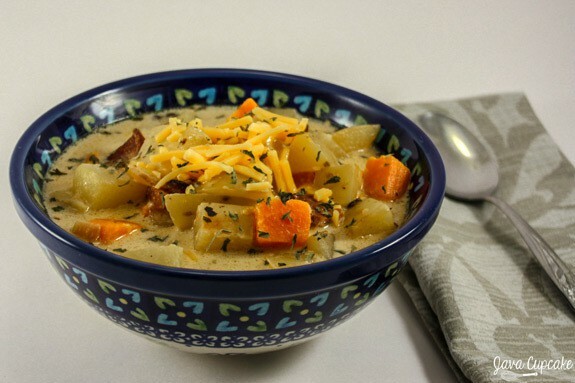 For more soup & dinner ideas, visit the recipe page for Meals, Soups & Snacks! Preheat a large pot on high heat. Cut the bacon into 1/2 inch square chunks. Add the bacon to the hot pot and cook until most of the pieces have browned on each side. Generously, season with cracked black pepper. Dice the onion and add it to the pot. Also add the minced garlic. Combine and cook until the onions begin to lose their color. Again, add more cracked pepper. Sprinkle 2 tablespoons of flour over the bacon and onions and mix until no more flour is visible. Cut the potatoes into 1/2-1in cubes. Peel the sweet potato, but leave the skin on the yellow potatoes. Add the cubed potatoes to the pot and cook for about 8 minutes or until they begin to soften and brown on all sides. Lightly salt the mixture and add more cracked black pepper. Pour in the chicken broth, heavy cream and milk and gently mix. Remove 1/4 cup of the broth and stir in 2 Tbsp flour. Mix until flour has dissolved. Add this back into the pot. Add the parsley. Taste the broth and add more salt/pepper to taste. Bring to a boil then immediately reduce heat to low-medium, simmer and cook for 15 minutes or until the broth has thickened and the potatoes are soft. Serve topped with grated sharp cheddar cheese and a garnish of dried parsley.